Many Centennial Park West condos feature luxury upgrades such as hardwoods, stainless and granite kitchens, balconies, assigned garage parking. The building has many amenities including 24 hour concierge, pool, fitness room, sauna and rooftop deck. 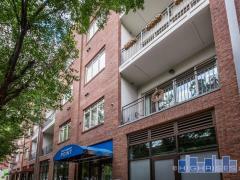 Walk to Centennial Olympic Park, CNN Center and more. Have any comments or questions about Centennial Park West? Ask your question and/or share your thoughts about this Building. Hi I'm interested in purchasing a condo in the future . What credit score , income , and documentation is needed to purchase ? Hello do you lease or only purchase? Moving to Atlanta end of Feb. In town now thru Wed to find a place to live.